What Thermal Energy RejectorTM (TER) is? There is a tendency for modern buildings to have a high need for cooling. 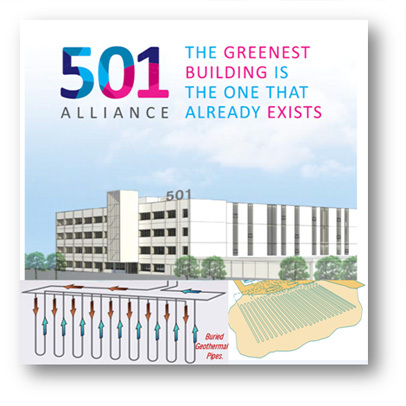 This is particularly significant for larger floor plate and / or high occupancy buildings with passive heat gains from people, lighting, computers and high solar gains from extensive use of glazing in the facade. Data Centres, Supermarkets have high cooling loads from server rooms and process cooling of food chiller cabinets respectively. The solution is Thermal Energy Rejector (TER). TER is an integral part of Hybrid Geothermal system uses to reject excess heat collected by the geothermal reservoir during summer operation in order to lower its temperature when outdoor air temperatures are low at night or in winter. This allows a large volume of Geothermal ReservoirTM to achieve significantly lower temperature which can be maintained over the spring and used in summer for the building to reject heat to – this permits natural cooling of the building at a fraction of the cost of air conditioning. Dry fluid cooler can be used if Thermal Energy Rejector system is not suitable for a particular site. How Thermal Energy RejectorTM Works? 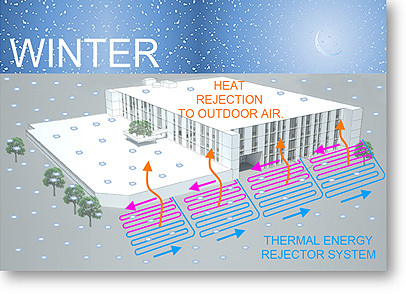 TER System uses thermal fluid which is mixture of water and antifreeze circulates through an array of ¾” pipes horizontally embedded in the surface of the outdoor parking, school playground or building fabric such as roof to reject excess heat when outdoor air temperatures are low at night or in winter. This system serve two purpose, first it provide passive snow melting and secondly it lower the temperature of a Geothermal ReservoirTM from its higher temperature state 75oF to 50oF or even lower over the course of the winter by just running the circulating pumps exchanging the heat energy via heat exchanger. No water to water heat pump energize to achieve this task besides they are satisfying building heating and cooling demands. This system runs on a temperature difference between geothermal filed and outdoor surfaces. 10% Smaller Geothermal Reservoir size. By comparing traditional geothermal field, the TER system works as an integral part of Hybrid Geothermal increases the energy efficiency ratio (EER) of Central Water to Water heat pumps or distributed heat pumps by 40% and significantly reduces carbon emissions in all seasons.